Since Steven Moffat took over as head writer of Doctor Who two years ago, there has been a noticable - and appreciated - shift away from the anthology structure that the show favoured under Russell T. Davies towards a more serialised form that follows in the tradition of American science fiction and fantasy shows. There were over-arching plots during Davies' tenure on the show, but they tended to be more to do with character than plot, and the closest it got to serialised narratives was the introduction of special words - such Bad Wolf, Torchwood and Saxon - that would appear in the background, only to be given meaning in the finales. Moffat's Who feels more like a longer story composed on individual elements, rather than individual elements that are somewhat crudely joined up at the end. Whilst I like the model of the show, I have to say that I found it incredibly jarring that, in service of this single story, there didn't seem to be any mention of the fact that Amy and Rory are looking for their kidnapped baby. You can argue that this is because they saw last week that they might not get her back, otherwise there's no reason why Melody would grow up to try to kill The Doctor, but it still feels weird to me having such a major plot point go unacknowledged. Then again, the last thing anyone wants is to see Amy and Rory curling up into the foetal position and crying over their lost child every week, so maybe a bit of cognitive dissonance in service of the plot is preferable. The plot of the episode was pretty slight; it turns out that George is actually an empathic alien who appeared when his "parents" Alex (Daniel Mays) and Claire (Emma Cunniffe) discovered that they couldn't have children. Their desperate desire for a child led George to fulfill that role, and the same power that gave him form allows him to give physical form to his fears, which in turn start attacking other people and dragging them into whatever realm he has created for them. 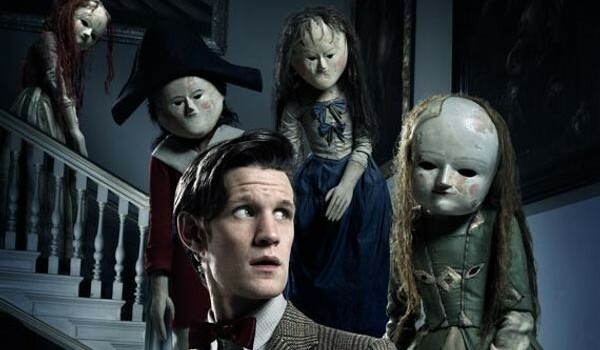 The Doctor, Amy, Rory and Alex end up getting trapped in the world of George's fears - represented by a doll's house - and are in turn chased after by the absolutely horrible doll creatures that you can see in the picture above. The story wrapped up when The Doctor realised that George needed to overcome his fears in order for them all to escape the nightmare realm he had created for himself, and that his greatest fear was that his parents would reject him. Cue a scene in which Alex runs to his son and says that he will never leave him and he will always love him, which it would be all to easy to be cynical about, but which I found affecting because parent-child relationships are one of those things that really hit home for me - I damn near bawled me eyes out during a similar moment in J.J. Abrams' excellent-up-to-a-point Super 8 earlier this year - so I thought that it worked, even if it was a bit of a heavy-handed and obvious way of resolving the episode. One thing that did bother me, though, was the fact that no one died. Obviously Doctor Who is a family show, and I don't want to see death after death every week because then the deaths lose all meaning, but when an episode is trying to be creepy and scary it helps for there to be at least one death to raise the stakes. Maybe this is much the same trick that Moffat and co. pulled last year, when they held off on the deaths for the first half to make Rory's demise in "Cold Blood" more effective, but if so it makes the episodes leading up to it feel pretty bloodless. The episode also boasted a more subdued visual style than usual, courtesy of director Richard Clark, who previously directed the very good episode "The Doctor's Wife" from earlier this season, and the pretty dreadful "Gridlock" and "The Lazarus Experiment" from the third season. It really suited the fairytale feel of the episode, which was capped off nicely by the final shot of The Doctor's information file from the Tesselecta listing the date of his death. Time catches up to everyone, even a time traveller.